There’s nobody like that in my church! The sentiment echoed in the back of my mind constantly, as I surveyed the faces of others on my cell block. I felt enough shame for being a Christian in the jail. The fact that I had once pastored one of the largest churches in the county compounded the shame, and drove me to a suspicion of every other inmate as I tried to avoid an embarrassing encounter with someone who knew me. I told the inquiring young man I did not know what he meant. The inquisition, however, had just begun. “I used to play drums for your choir.” I did not recognize him until he told me his mother’s name. She had been on my staff. “I am so glad you’re here!” That made one of us. I do not for a second believe God sent me to jail for any reason other than to save my life. But the young man’s sentiment reflected two realities: first, that there are inmates who want to and will change if they have relationships with someone who believes in them and second, that there are a number of incarcerated people who are already connected to houses of worship. “There’s nobody like that in my church!” So respond more than a few Christians and church leaders when I explain to them that our ministry, Healing Communities, helps congregations minister to their own members affected by incarceration. “We already have a prison ministry!” I often receive that response when I talk about how we need to connect our congregations with the prison populations. Both responses reflect flawed thinking. In the first case, it is virtually mathematically impossible for a congregation to be completely disconnected from the system of jails and prisons in our country. With over a million and a half men and women in state and federal prison, and another seven million churning through county jails annually, the odds are infinitesimal that a congregation does not have a family with an incarcerated son, daughter, grandchild or parent behind bars. While in the county jail, I met seven young men with connections to my former church. Had they been in the hospital, they would have received attention from the church as a whole. As prisoners, their religious support came from a handful of volunteers from another congregation. Healing Communities USA seeks to equip congregations to engage the prison population by beginning with the families in the church directly impacted by incarceration. We believe that the stigma and shame associated with prison and jail deter families from seeking the support they need in dealing with the pain of separation, sense of loss and/or betrayal, and changes to family dynamics caused by incarceration. By helping congregations create a culture of forgiveness, restoration and redemption, we can support people like the young man I encountered in my county jail, and support his family through the process of his and their ordeal. By engaging the real life experiences of inmates and their families, mass incarceration changes from a public issue “out there” to an amalgam of personal trials “in here.” When we recognize that this reality is before us, we enhance our capacity to become advocates for system and policy change. When preaching, I often do altar calls for families of the incarcerated. Many pastors show surprise at the numbers who come forward. Many members exhibit a new found empathy toward persons they know, but “did not know that” about them. “Never again,” declared one pastor from his vaunted pulpit, “will a mother from this church have to endure the pain of her son’s incarceration by herself.” And as they walk with her, her son, and others in the congregation, their ministry of advocacy concerning mass incarceration grows, because now, it is personal. 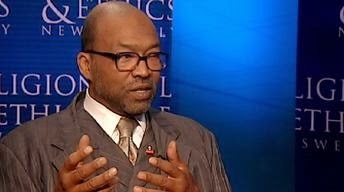 Harold Dean Trulear serves as Associate Professor of Applied Theology at Howard University School of Divinity. He is also National Director of the Healing Communities USA Prison and Prisoner Reentry Ministry. A Phi Beta Kappa graduate of Morehouse College, he completed his Ph.D. Degree with distinction at Drew University. He also serves as a Fellow at the Center for Public Justice in Washington DC, and is a member of the Executive Session on Community Corrections at the Kennedy School of Government at Harvard University. Dr. Trulear serves on the pastoral staff of Praise and Glory Tabernacle in Southwest Philadelphia, and has served in pastoral and youth ministries in Pennsylvania and New Jersey for close to forty years. His columns and features on religion and criminal justice have appeared in The Crime Report of John Jay School of Criminal Justice, Prism Magazine, The Living Pulpit and The Capital Commentary, and he has written over one hundred scholarly articles, book chapters, field reports and book reviews. He is a contributing editor to: Ministry with Prisoners and Families: The Way Forward (Judson Press, 2011), George Kelsey: Unsung Hero (Andover Newton Theological School, 1996).